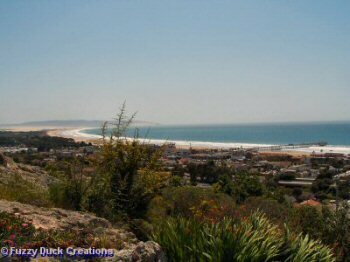 Pismo Beach is one of the all-time favorite beach cities for many. A wide sandy beach, a beautiful pier, great lodging and restaurants and fun attractions explain some of the appeal. Pismo says of itself that it is "classic California" - as in hearkening back to the 50's and 60's. That's pretty much true in my experience. 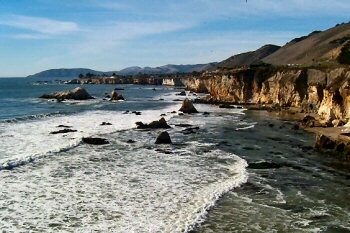 Pismo is a comfortable, relaxed beach town as most are and does invoke quite a bit of nostalgia. Long famous for the pismo clam, Pismo has one of the most expansive beaches anywhere in California. Like most beach towns, Pismo doesn't take itself too seriously and for that reason it is quite comfortable and welcoming for visitors. There are restaurants from casual to fancy. Likewise with the lodging, the range is from full service spas to budget rooms. Shopping, many fun events throughout the year, a long and beautiful pier, and a winter haven for monarch butterflies. Add in the huge sand dune complex that starts at the city's south end, you have a great place for a California beach vacation. Translation of the name "Pismo": "Tar" from the numerous tar seeps that the Chumash natives used for caulking their ocean-going canoes. Beach wheelchairs are available to the public and visitors at no charge. Beach wheelchairs are available at Wheel Fun Rentals. The beach itself at Pismo shows two faces depending on which end of the city you find yourself. 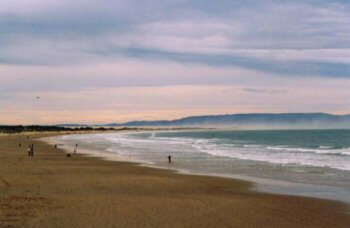 The photo here shows the view south from around the Pismo pier with the great, wide and sandy beach. This extends for miles and turns into the great sand dune complex around Oceano. A bit to the north of the pier you will find the beach turning rocky and with cliffs. These are great places for kayaking, and there are several places for kayak rental and lessons. Pismo Beach has the largest butterfly grove in the US and in most years the largest gathering of monarch butterflies. 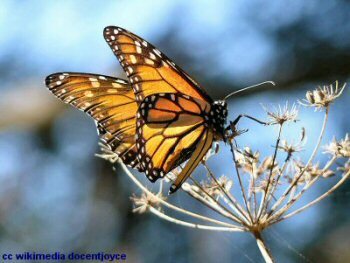 The monarchs overwinter here and in other places from late October through February. This last winter (2011-12) there were well over 20,000 butterflies in the grove. A sight to behold. More information on the monarch butterflies at this site. (Opens in new window). 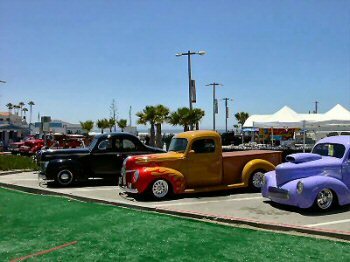 One of the main events which makes this city "classic California" is this very popular car show. Auction, Car Corral, Car Show, Cruise, Party / Gala, Poker Run, Rally, Rod Run, Show & Shine. Over 1000 classic and restored cars. The 66th Annual Pismo Clam Festival: October 19-21,2012 For more information call the Chamber at 805 773-4382. Pismo has long been known for its clams and the fact that this festival has been around for so long attests to that. You can use the search box to the right to do some preliminary shopping for hotel rooms here, or go right ahead and book your stay. This box uses Hotels Combined which searches many sites to find you the best rates for your Pismo vacation. Well known for its clam chowder, which is some of the best we've ever had. Casual, but very good seafood, and we're quite picky. Very good Italian, and we're even pickier about that! If you'd like some more ideas for fun things to do at the beach, check out our extensive list at this page. 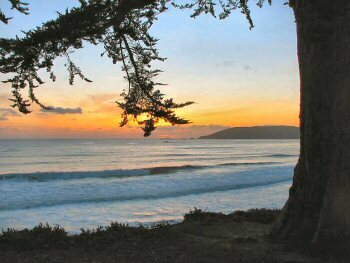 Pismo Beach could also be a good base of operations for exploring other beach cities up and down the coast such as Avila Beach, or Oceano. We didn't even mention wine tasting, and there are several tasting rooms right in town. Or you could take a little trip up Price Canyon Road and sample some of the vintages in the Edna Valley. Have a great time on your beach vacation!